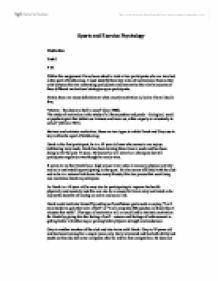 Sports and Exercise Psychology Motivation Task 1 P M Within this assignment I have been asked to look at two participants who are involved in the sport of kickboxing. I must identify three key roles of motivational factors that exist between the two contrasting participants and summarise the relative success of three different motivational strategies upon participants. Firstly, there are many definitions to what exactly motivation is, below I have listed a few; "Motive - the desire to fulfil a need" (Cox 1998). "the study of motivation is the study of all those pushes and prods - biological, social or psychological that defeat our laziness and move us, either eagerly or reluctantly to action" (Millers 1967). 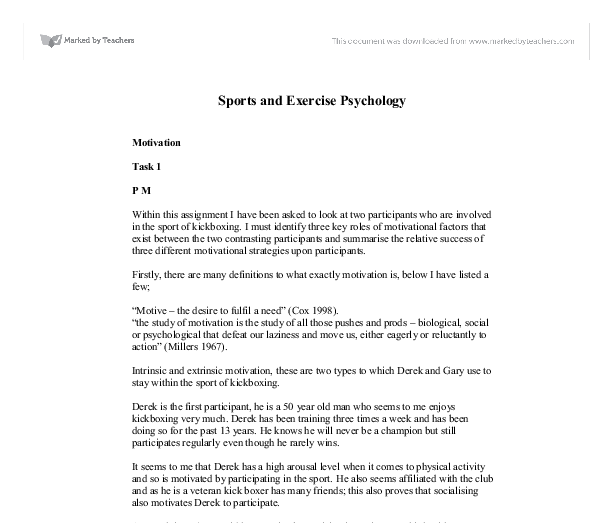 Intrinsic and extrinsic motivation, these are two types to which Derek and Gary use to stay within the sport of kickboxing. Derek is the first participant, he is a 50 year old man who seems to me enjoys kickboxing very much. Derek has been training three times a week and has been doing so for the past 13 years. He knows he will never be a champion but still participates regularly even though he rarely wins. It seems to me that Derek has a high arousal level when it comes to physical activity and so is motivated by participating in the sport. ...read more. This area of motivational strategy can be very effective, to Gary if he set himself small reachable goals, I believe he would continue kickboxing for a longer period as he would be achieving and have a feeling of success when these short term goals are met, he could build up all the short term goals to end on a long term goal of say; winning a competition or contest bout. In Derek's case, I feel that if he also sets himself small goals then this may build up his confidence in competing, goal setting can make an individual feel success within smaller expectations, then later the big hope or expectation can be met allot easier than trying to reach a big goal all at once. Rewarding: this is when you receive a reward externally or internally for you win or performance such as money or trophies and self-esteem and self-confidence. I believe that if some sort of rewarding was introduced to Gary's training strategy this may encourage him, however one would need to be careful as to how much rewarding was given. Only if Gary completed a task at a high level or reached a goal set should he receive a reward, this would limit Gary taking part just for an external reward. ...read more. M - Stands for measurable; make sure the goal is able to be reached easily "I want to run 100m in under 11 seconds" A - Stands for, agreed, this is when another member of your team or coach can agree that the goal set is good and you are happy with if not it must be changed. R - Stands for realistic, this is a goal that can be achieved and is not an unrealistic goal, and you are capable of it. T - Stands for time, what type of time phase do you have, have you set yourself four weeks to reach it or longer or shorter, this must also be accounted for. Also looking at extrinsic rewards, this again is another effective motivational strategy, however not one that I admire. I think this is because, one can get dependant on external rewards and 'gifts' in order to complete a task successfully, I also feel there's an age limit with this type of motivation. For children I believe this can be an effective drive to succeed, or behave or complete a task correctly, however once an individual understands the task but has learned that if he completes it well he/she does not get an extrinsic reward than this effort and enthusiasm will be lost, thus we must strive to motivate and encourage individuals of all ages with realistic motivational strategies that can help a person/athlete. ...read more. The team may still lose, however this player is motivated through personal achievement, which may be a more powerful motivator for future performance improvements. Theories of motivation Attribution theory & motivation This is the perceived cause of a particular outcome. principles of training, as I was able to use the main ones and like them in fully with the Personal Exercise Programme. I felt that I had done enough warm up and cool down to prevent any injuries, prepare my body for exercise and aid recovery. the colour of my teammate's singlets, the sweat patches that were on the singlets and the actual spin that the ball had while travelling through the air. However the detailed pictures came at a cost, as the sounds of the centre faded away and throbbing feeling of my heart rate disappeared. less able participants wont want to take part if they feel they can't do it and the able participants wont find it challenging enough and it will be tedious. Being a sports leader means taking on the role of being an educator. Age can be a negative and a positive factor. If a person who plays basketball is too old then stamina and flexibility would affect their performance. Loss of speed would make playing point guard in basketball a lot harder as it is a crucial skill needed. If cues within the environment are not used effectively, then the athlete will fail to collect relevant information from around the area of play, for example: a football player may not be aware of movements off of the ball - that are likely to affect his next pass.